Travelling to Hue for the first time can be a memorable experience, especially when you’ve done your research. This UNESCO-listed city is known best known housing the Royal Palace of the Imperial City, which dates back to the 19th century. Hue is a favourite holiday destination amongst travellers who prefer a quiet retreat as it’s not as busy compared to cities in Vietnam such as Hanoi and Ho Chi Minh. You can also find plenty beaches outside the city centre, including Thuan An, Lang Co and Canh Duong Beach. Read on for our Hue Survival Guide, which includes some ideas on where to stay, eat, shop, and party in the historical town. Hue is home to 19th century structures, royal tombs, and ornate pagodas, most of which are easily accessible on foot or bicycle. The city’s hotels, restaurants, and bars are located opposite Hue Imperial City, where you cross Perfume River via Truong Tien Bridge. You can also enjoy plenty of local restaurants that recreate dinner courses that were once served to royalty. Nightlife here is rather limited, but you can find a bar or two that stays open until late. Exploring Hue on foot or cyclo is easy, especially if you’re staying in the city centre. The most popular landmark is UNESCO-listed Hue Imperial City. The complex takes about two hours to explore as you can see hundreds of monuments, temples, a museum, a library, and royal quarters. Daily cultural performances are held at 09:00, 10:00, 14:30 and 15:30. In the evening, many travellers opt for a boat cruise along Perfume River to catch the sun setting over Hue. Hue’s shopping scene is laidback and simple, which means you won’t find modern shopping malls or high-end boutiques. Local markets, art galleries and tailor shops are plentiful, making it a great city to shop for authentic handicrafts, silk paintings, antiques, and lacquerware. About a 10-minute drive from Hue Imperial City are several non-profit organisations and fair-trade outlets where proceeds go towards supporting the less fortunate. Nightlife in Hue is rather quiet, but there are several bars and pubs that offer a good range of drinks and live entertainment. Most of these venues are set along the backpacker streets of Pham Ngu Lao, Le Loi and Nguyen Cong Tru, which are located about a 15-minute drive from Hue Imperial City. Five-star hotels and resorts are fitted with elegant lounges and all-day bistros. Hue dishes were once exclusively served to past emperors and royal families of the Nguyen Dynasty, but there are many local restaurants, roadside stalls and high-end resorts that serve these specialities all year round. Catering to international demands, Hue also has a good mix of trendy bistros and expat-owned cafes serving western fare such as pastas, pizzas and grilled meats, as well as imported wines, beers and spirits. Hotels in Hue come in a good variety, be it affordable budget hotels to the more luxurious types. 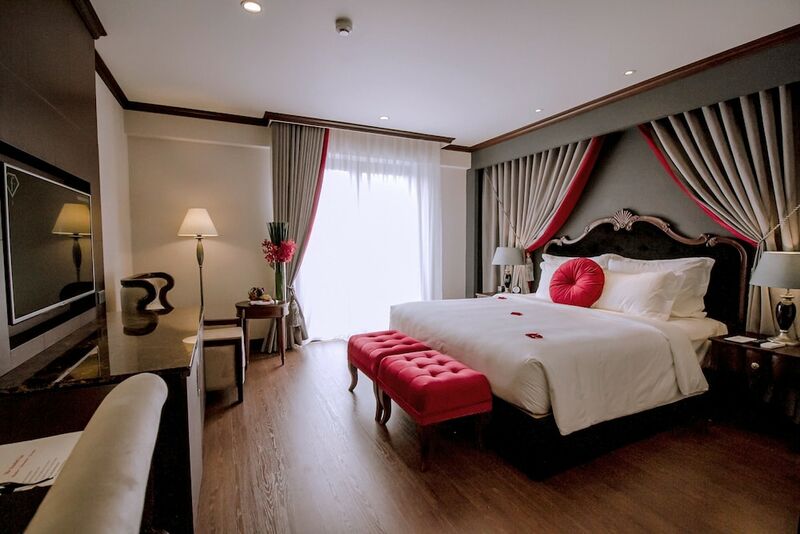 Aside from quality service and comfort, our favourite hotels offer ease of access to many landmarks, restaurants, and shops in Hue City Centre.